Opera in the eighteenth century was dominated by the singer. Indeed, it was the age of the singer offstage as well as on: they were the first celebrities, described as ‘stars’ in their own day, and capable of earning salaries that would, today, put them in the same league as footballers. It is not surprising, then, that audience members could breach all bounds of social propriety in their cultish enthusiasm, one aristocratic lady in London apparently blaspheming: “One God, one Farinelli!” at that famed singer’s appearance in Britain in the 1730s. The reason for such status was, in large part, to do with the singers’ vocal skills. In the early eighteenth century a cycle emerged in the development of opera, whereby the more central the singer was to the drama, the more the audiences clamoured for them, the more financial remuneration such singers could demand, the more time singers and their teachers would spend developing their vocal skills, and so the more central they became to the drama . . . and so on. This centrality was expressed particularly in the expansion of the aria, both in length and in complexity: by the 1740s, arias could last for well over 10 minutes – which inevitably meant fewer arias overall, and more emphasis on a few key individuals. Whether contemporaries saw this as a virtuous cycle or a vicious one very much depended on their point of view: critics (especially librettists) railed against the rise of the singer; audiences rejoiced. And so, while in the seventeenth century the primary vehicle of singer accomplishment had been the slow, ‘pathetic’ aria, in the eighteenth century arias displaying virtuosity were favoured, and the aria di bravura and aria d’agilità were born as categories for measuring a singer’s worth. As Goldoni’s comments show, the kinds of arias a singer was given came, during the course of the century, to indicate their status within a company; librettists such as Goldoni therefore had to be careful to engineer the right sorts of situations and aria texts for a composer to set in a way that would show off a singer’s varied abilities, and thereby please both the singer and (through them) the audience. Managing the complexities of aria convention, dramatic structure and singer ability was no small task for either librettist or composer. In the 1720s and 1730s, librettists were fortunate indeed that they had composers of the calibre of Vivaldi and Handel to work with. Indeed, a young Goldoni worked with Vivaldi in 1735 on the Venetian production of Griselda, an old and very popular story concerning the long-suffering peasant wife of a king, whose faithfulness in the face of his abuse is eventually rewarded (as it was seen at the time) by her return to his affections. And the composers were in turn fortunate in their choice of singers. Vivaldi’s favoured singer was Anna Girò, without whom, he declared, he could not compose an opera. Girò’s talents were dramatic rather than musical, however, and so while she took the title role in Griselda, it (like other operas) had to be adapted to suit her abilities. And Vivaldi had to look to other singers to satisfy the audience’s demand for vocal pyrotechnics. In Act Two of Griselda, the character of Costanza is given the extraordinary ‘Agitata da due venti’ (which Vivaldi appropriated from his earlier L'Adelaide), in which the text’s notion of competing love and duty as equivalent to two winds buffeting the soul allows vocal display of rapid ornamentation and wide leaps. Simile texts were a common means to facilitate musical display in an aria: while ‘winds’ are used in Griselda, in L’Olimpiade (1734), boats on a storm-tossed sea (as well as winds) are the means to generate similar opportunity for virtuosity. ‘Siam nave all’onde algenti’, for the servant character of Aminta, was a vehicle for the young castrato, Mariano Nicolini (another protégé of Vivaldi’s), to make his debut on the Venetian stage, and apparently Vivaldi’s gamble worked, as Nicolini was reputedly responsible for the resounding success of the opera. It is interesting that, at this stage, Goldoni’s dictum had not entirely set in, and it was still possible for minor singers to not only be assigned important music, but also to carry the show. Juditha Triumphans, from 1716, is a rather different work – a ‘sacrum militare oratorium’, or sacred military oratorio. It is a ‘military work because it was intended as allegorical, with Judith and God’s chosen people representing the Venetians, and Holofernes and his warriors representing the Turks, against whom the Venetians were then at war: Judith’s beheading of Holofernes was thus a representation of the Venetians’ military success. The oratorio in Italy was at this stage strongly related to opera in its aria-dominated structure, and increasingly in its use of direct characterisation rather than narrative; but because it was performed unstaged and from scores, it could be rather more elaborate musically. In Vivaldi’s Venice (unlike Handel’s London), oratorio also drew on a different pool of performers from the opera – most notably, the female musicians of the celebrated Ospedale della Pietà, whose musical virtuosity attracted visitors from all over Europe, but whose requisite modesty led them to perform from behind gauze screens. In Juditha Triumphans, all the parts (including those of the men) were taken by female singers, who were named (with first name only, as they were foundlings) in Vivaldi’s score. So, just as young castrati could perform female roles on the operatic stage, so in oratorio women could perform male roles: the singer ‘Barbara’ who took the part of Vagaus (Holofernes’ second-in-command) was evidently a skilled virtuosa, as the tempestuous call to vengeance, ‘Armatae face, et anguibus’, indicates. Its relative brevity, alongside the arias from the two Vivaldi operas recorded here, indicates not lesser talent (indeed, commentators often suggested that the female musicians of the Pietà put their male professional contemporaries to shame), but rather its earlier date. Handel, working for most of his career in London, had a much smaller pool of singers on which to call. 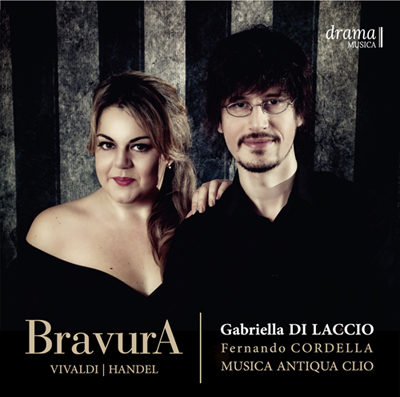 So in 1711, when he composed Rinaldo, his first opera for London, the beautiful sarabande, ‘Lascia ch’io pianga’, was given to an otherwise little-known soprano, Isabella Girardeau; although this was perhaps the most popular aria of the opera, its limited range and vocal demands indicate Girardeau’s own restricted abilities. But by 1718 Handel was fortunate that the buying power of the Royal Academy of Music (the Italian opera company then established in London) was such that many of the best singers of the day were drawn to Britain, despite its legendarily bad weather. In Francesca Cuzzoni, the singer for whom he created the role of Cleopatra in Giulio Cesare (1724), Handel had one of the best-known exponents of the older, pathetic style. Indeed, Cuzzoni’s talent was memorialised by the singing teacher, Pier Francesco Tosi, in his Opinioni de’ cantori antichi e moderni (1723), in which he presented her as the ‘antique’ opposite of Faustina Bordoni, whose novel, bravura style was to be so admired when she arrived in London in 1726. However, the beginning of Act Three of Giulio Cesare, which focuses on the plight of Cleopatra, demonstrates that Cuzzoni’s talents were varied and formidable. In the first scene of the Act 3, Cleopatra is discovered locked in prison by her brother, and so in ‘Piangerò la sorte mia’ Handel gave Cuzzoni the opportunity to show off her melancholic style, in the aria’s A section. But the B section (in which she rails at her brother) provided the chance to demonstrate some brief, rapid-fire virtuosity. Once Cesare has freed her, two scenes later, ‘Da tempeste il legno infranto’ shows pure virtuosity, demonstrated not only in its texture of repeated, rapid runs and trills, but also in wide-ranging leaps. The text, dealing in the tried-and-tested metaphor of the ship on the storm-tossed sea (already seen in ‘Siam nave all’onde algenti’), was a clear invitation to Handel for such a setting. Cuzzoni, who quite certainly knew of negotiations to bring the virtuosic Faustina to England, would have relished an opportunity to demonstrate that she was equally capable of coloratura display.